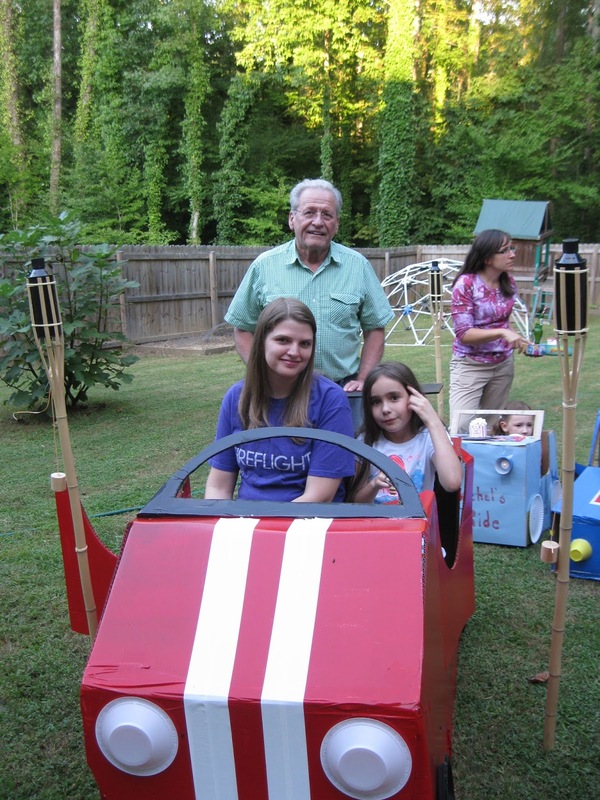 Solagratiamom: Drive In Movie Themed Birthday! Drive In Movie Themed Birthday! 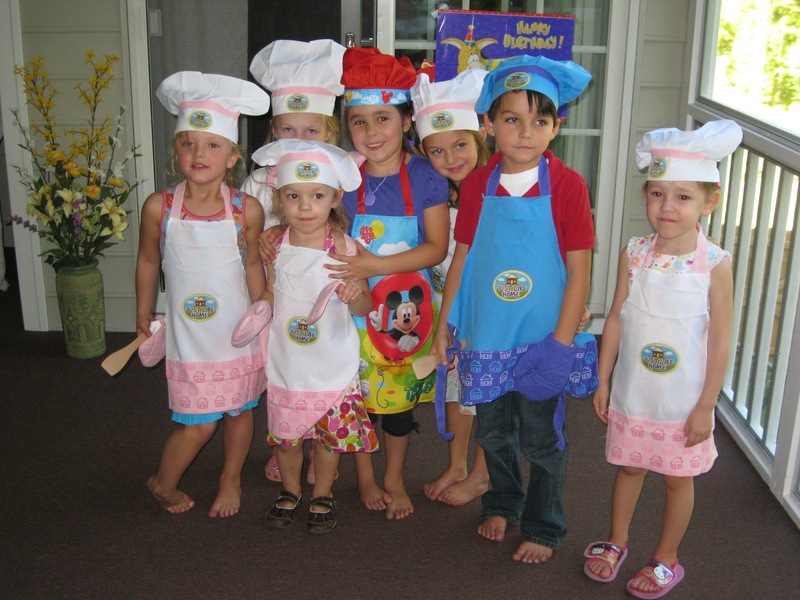 We have a tradition in our house that I started when my daughter was about 4 years old...it was themed birthday parties. I enjoy doing them (though I understand some would find it stressful or over the top -but different strokes for different folks!) to me it's a creative outlet and it's fun. Sarah enjoys helping me develop out the theme and come up with how we will make it "real" as we explore and create ideas together. It's certainly not for everyone, but if you enjoy this type of thing or spend time on Pinterest looking for ideas because this is up your alley - then here is what we did and how we did it. 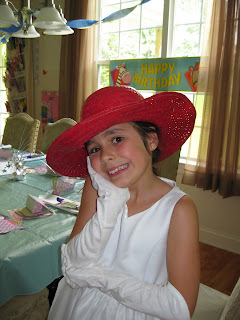 When Sarah was little we did lots of crafts - she enjoyed it and so did I. 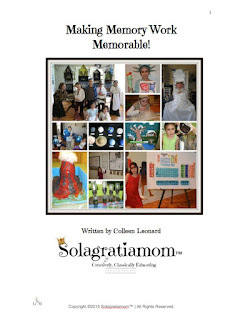 It just seemed like an extravagant craft project to us! We started with a pirate party and then we did a dress-up/costume party, baking party, spy party, tea party and this year's theme was a "drive-in movie" themed party! I sent out these invitations that I personalized for her party. Since we personalized the party and she wanted certain foods and candies (that I can't buy unless they are dye free and organic - which means I have to buy everyone's that way because of my conscience about those foods for kids) I limited her to just inviting a handful of friends we knew would be game to "build cars" and participate in the fullness of the theme. 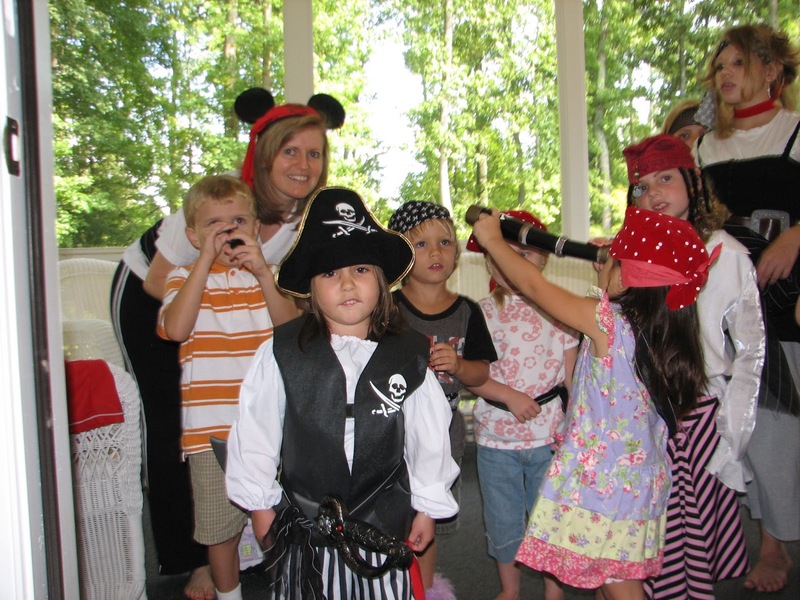 It is one downfall to highly personalize parties -so we do mix it up - there have been years where they were still themed in a way that lots of kids could join in and it was still manageable for me. My husband started with a water heater box. He taped his box and then cut out his design. He took extra cardboard and made a tail and windshield as well. We then had Sarah paint the tail and windshield black to start with. We next tried spray paint to see if that would cover the car but we realized it would soak in too much and didn't work very well. We realized tempura paint would be safest for our daughter to "paint it herself" and then we'd go back over it with house paint, which is what it really needed to cover it and make it red like she wanted. My husband made a second car out of a dishwasher box for Sarah's best friend to be able to have her own car since she lives with a single Mom. She wanted hers pink and was able to paint it herself with pink tempura paint. Black paper plates were used to make wheels and red circles spray painted on the back for tail lights along with white plastic bowls for headlights on her friend's car. Since my daughters car was red we had to come up with another way to make a tail light to show. I used empty applesauce cups and cut red construction paper circles to glue in them. I then hot glued them to the back of her car to be her tail lights. The wheels were black plastic plates with computer disks in the center to make them more "real" looking. The head lights were white plastic bowls. We then added white duck tape down the top for racing stripes. To watch the movie we were able to fit two small kids chairs inside the box to sit on for the movie. The day of the party I made a sign to place out front for the girls arriving, that directed them to "drive" their cars around through our gate to the back yard and "park" them there. I found tiki torches on end of season sale really inexpensively so I decided those would make great "parking" stands for the movie theatre (you know the old drive-ins had those poles you pulled up to and placed the "speaker" inside your window). The cupcakes I got from a local gluten free bakery and then I printed popcorn looking labels onto cardstock to place around each cupcake to make them appear as popcorn boxes which I found here. I added marshmallows to them and a hint of yellow food coloring to make it appear as popcorn. Healthy soda from Whole Foods and vintage striped red and white paper straws finished it off. I used the plastic popcorn boxes that I picked up at the dollar store to hold my chocolate, lollipops, hotdog buns and straws. I got the napkins and plates online at Amazon as well. Added a few helium balloons from Party City and the streamers and the decorating was done! 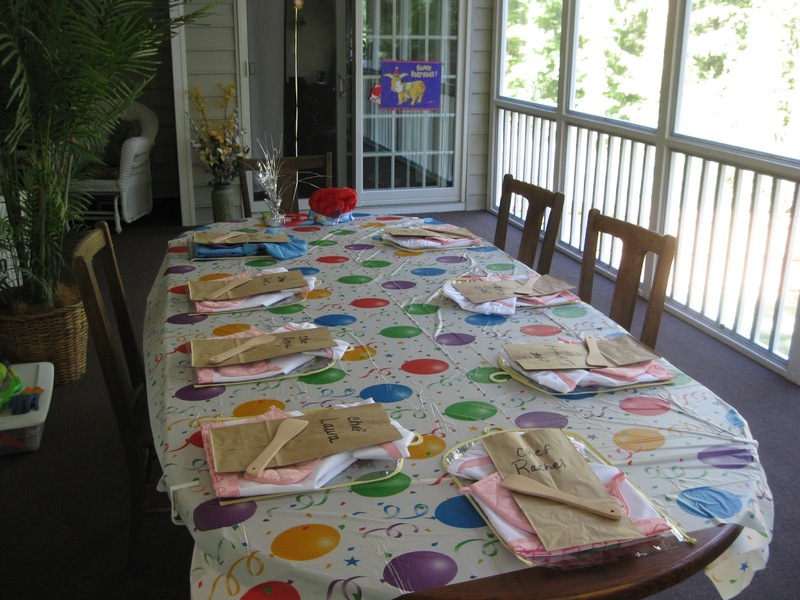 The party favors were decided to be "Walk of Fame" squares that the girls would place their handprints on at the party. I made these by cutting out 9"x9" square pieces of cardboard to spray paint gray. I then took gold cardstock paper and printed stars onto it. I found a hollywood camera clip art that I reduced to print and cut out, so I could glue it onto the stars -making it look like the Hollywood Walk of Fame star. I next printed each girls name onto paper large enough to be proportional to the stars and I glitter sprayed them along with the stars. I hot glued them onto the squares and sprayed the whole square with star and names, one last time with glitter spray. I then found at the dollar store, some certificates that I had the Moms at the party use to award various categories for their car creations. The categories were such as "Best Use of Duck Tape", "Hottest Hot Rod" etc. We then took the awards and set them up down by our fire pit with a "red carpet" leading to it. Each child's name was announced with their award category they won and they then walked the red carpet and placed their hands in black tempura paint to place a handprint on their "star" while receiving their award. While the kids watched their movie later, I hot glued on the back a "marque" that said "Thanks for Coming" which I found here. I gave the kids their certificates and their Walk of Fame stones as their party favors when they were leaving. 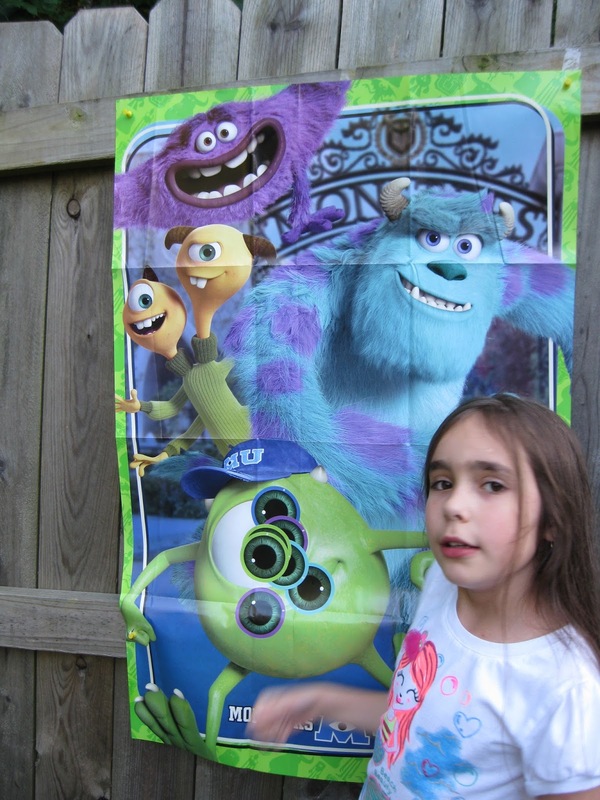 Some of the games that we played were Pin the Eye on Mike that I found at the Party City store. (The movie my daughter picked was Monsters Inc. since she had not seen it and loved Monsters University) We also played a game where movies were written on pieces of paper and each girl took a turn with one being placed on her forehead where she couldn't see the name of it but everyone else could. She then went around the circle and was allowed to either ask a question or be given a clue (excluding character names) and try to guess the name of the movie on her head. We had a guest appearance by my Dad who flew in from NY to spend this birthday week with my kids (both are September kiddos)! He "signed" all the certificates for the kids on their Awards too. It was cute! Once we played our games and loaded up on the goodies at the concession stand - it was getting dark and the movie was about to start! Sarah made a license plate that said "2CL-KTS" for Two Cool Kats - since she had a friend rider with her for the movie! Happy Birthday Sarah Bear! We love you! We had lots of fun! 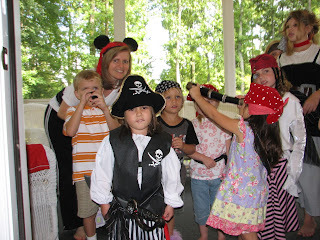 Here are some of Sarah's other themed parties from the past! Stay tuned to see what she comes up with for next year! Thank you Suzi :) My husband was a great sport with it all and so weren't all the other Dad's who also made cars and gave it a great go! 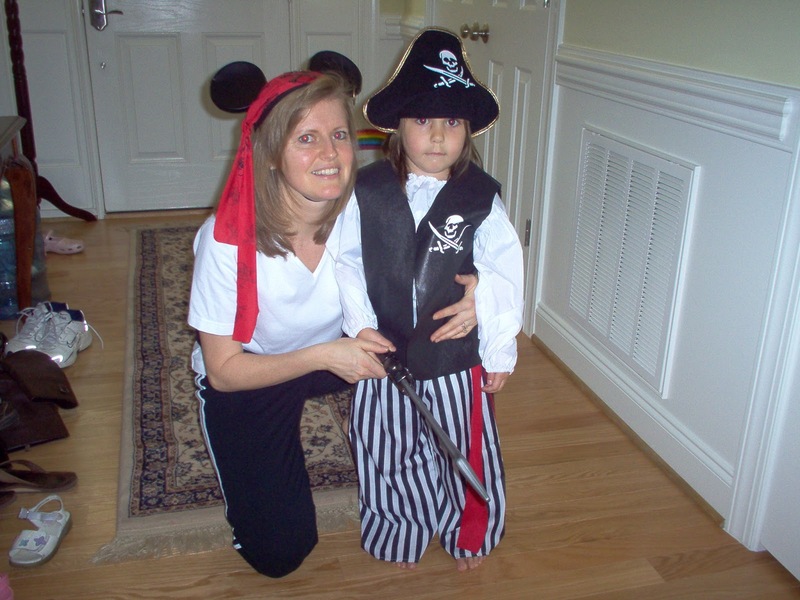 I do make her limit her party - since they are very personalized most of the time for each kid that comes - costs and my time are a major factor into that decision to limit her. We had her choose all girls and friends she sees the most and does the most with on a regular basis.